With at least 400 scholarly works and 2000 extant manuscripts written over a millennium to its name, there is hardly a book in history that has received as much scholarly attention as Imām Muḥammad ibn Ismāʿil al-Bukhārī’s magnum opus, Ṣaḥīḥ al-Bukhārī. To acquaint readers with some of the most authoritative surviving manuscripts of the Ṣaḥīḥ, Markaz al-Sunnah wa al-Turāth al-Nabawī published a treatise detailing nine manuscripts. I used the aforementioned treatise as a template to prepare the following article. I substantially edited and annotated the descriptions and added an entry for a recently discovered manuscript. Further details on some of these manuscripts (e.g. al-Ṣaghānī’s and al-Yūnīnī’s) or questions left unanswered have been addressed in my previous articles on the subject. In 353 AH, the Andalusian scholar Abū al-Ḥasan al-Qābisī (d. 403 AH) studied Ṣaḥīḥ al-Bukhārī under Abū Zayd al-Marwazī (d. 371 AH), a student of the seminal transmitter of the Ṣaḥīḥ, Muḥammad ibn Yūsuf al-Firabrī (d. 320 AH). Recently, a secondary copy of al-Qābisī’s recension has been discovered. Few details have been shared about the manuscript, but what we know so far is that it was transcribed in the first half of the 9th century AH, if not earlier, in Maghribī script and comprises 508 pages. In a fashion reminiscent of al-Yūnīnī’s project, it was auditioned in a gathering of scholars over 28 sessions and cross-referenced with other manuscripts and recensions in the Grand Mosque of Ceuta, Spain. That this is a copy of al-Qābisī’s recension is evidenced by numerous references to al-Qābisī’s variants that have been affirmed by this manuscript. Abū Muḥammad al-Aṣīlī (d. 392 AH) was a scholar from Andalusia. He studied the Ṣaḥīḥ alongside al-Qābisī under Abū Zayd al-Marwazī in Makkah in 353 AH. This manuscript is believed to be the recension of al-Aṣīlī via Abū Zayd al-Marwazī. Only 52 folios are available, comprising the chapters of zakāh, ṣawm, and ḥajj, in the Mingana Collection at the Cadbury Research Library. Based on the style of writing and chain of transmission cited in the beginning, some scholars consider this the earliest extent manuscript of the Ṣaḥīḥ dating it to the lifetime of al-Marwazī or the transmitter from him, but others have proffered a later date. It contains the reading signatures of Ḥadīth experts from Egypt and Andalusia; one signature is dated to Ramadan 464 AH in Alexandria. It was compared with Abū Dharr’s (d. 434 AH) copy and another manuscript that contained the writing of Abū al-Waqt al-Sijzī (d. 553 AH). Abū ʿImrān Mūsā Ibn Saʿādah (d. c. 522 AH) was a Ḥadīth scholar from Valencia, Spain. His main teacher was his father-in-law, the celebrated scholar of Zaragoza, Abū ʿAlī al-Ṣadafī (d. 514 AH). Al-Ṣadafī’s manuscript of the Ṣaḥīḥ was copied from the exemplar of Abū al-Walīd al-Bājī (d. 574 AH), who transmits from Abū Dharr al-Harawī (d. 434 AH) from his three teachers via al-Firabrī. Al-Ṣadafī is noted for his expert refinement of his manuscript of the Ṣaḥīḥ and cross-reference of it in prestigious Ḥadīth circles throughout the Muslim world. In 482 AH, Ibn Saʿādah transcribed and annotated his personal manuscript of the Ṣaḥīḥ from al-Ṣadafī’s copy and then read it to him sixty times; he also read it to other teachers and dictated it to drove of students. Hence, it has gone through a rigorous process of refinement and editing. For centuries, Ibn Saʿādah’s manuscript was the center of scholarly focus and served as an exemplar for most secondary manuscripts in North Africa. ʿAbd al-Ghanī al-Maqdisī (d. 600 AH) was a prolific author and Ḥadīth expert of the 6th century AH. His manuscript of the Ṣaḥīḥ was transcribed from Abū al-Waqt’s manuscript and contained other variants. Until the 9th century, al-Maqdisī’s manuscript was the most authoritative for the Levantines, with attendance signatures from al-Mundhirī (d. 656 AH), al-Dhahabī (d. 748 AH), and al-ʿAlāʾī (d. 761 AH). Al-Yūnīnī had a scribe pen a copy of this manuscript to use as the mother-text for his legendary audition in 667 AH. This manuscript, transcribed in 708 AH, was read to Levantine Ḥadīth experts like Jamāl al-Dīn al-Mizzī (d. 742 AH), ʿUmar ibn al-ʿAjamī (d. 777 AH), Ibn al-Shiḥnah (d. 815 AH), and Sibṭ ibn al-ʿAjamī (d. 841 AH). ʿAbd al-Qādir al-Maqrīzī (d. 732 AH) compared it with other valuable manuscripts. I came across several secondary copies of this master exemplar. In my estimation, the most outstanding of them is the notable secondary copy—possibly superior to the original: the copy attributed to the authority, the Ḥadīth scholar, Shams al-Dīn Muḥammad ibn Aḥmad al-Mizzī al-Ghazūlī, which was endowed to the Tankiziyyah by the Maḥrūq entrance outside Cairo. It was cross-referenced multiple times with two copies endowed to the madrasah of Ḥājj Mālik and al-Yūnīnī’s exemplar, such that nothing was omitted. I, therefore, relied on al-Ghazūlī’s copy to transcribe the text of Bukhārī in my commentary. I consulted it for diacratizing and vowelizing the text and the chain of every ḥadīth while noting the variant recensions and important notes found in the marginalia. [Al-Ṣaghānī] transcribed it [the first half] from a manuscript that was written in al-Bukhārī’s time and contains al-Firabrī’s writing apart from three parts that were lost from Firabrī’s copy, in which case an alternative manuscript was used. The mark for al-Farabrī is fāʾ; what conflicts with his manuscript is marked with a dot and whatever corresponds to it is marked with an elongated fāʾ with a dot above it; al-Ḥamawī’s recension is marked with a ḥāʾ, Abū al-Haytham’s with a hāʾ, Abū Isḥāq al-Mustamlī’s with a sīn, and al-Mustamlī’s and Abū al-Haytham’s joint variants with sīn/hāʾ; and potentially misunderstood passages are marked with ṣād/ḥāʾ. The scribe vowed to transcribe this manuscript in a state of ritual purity while fasting. After the transcription of each musnad ḥadīth, he will pray two units as a token of gratitude, then prostrate in gratitude asking Allāh to fulfill his worldly and spiritual needs, then recite ten verses from the Qurʾān and send salutation upon the Prophet (peace and blessings be upon him) ten times, and he will then move on to the next ḥadīth. He will use pens that will not be used to write any other material, and the shavings of these pens will be preserved to be mixed with the water that will wash his body after death. At the time of transcribing this half of the book, he remains in the captivity of the disbelievers, separated from his family and home and prevented from exiting alone even for the Friday and ʿĪd prayers. The transcription was completed after the ʿAṣr prayer on Friday on the day of Naḥr (10th of Dhū al-Ḥijjah) 625 AH. It was then realized that the final task was mistakenly not written per the conditions laid out above, so it was rewritten in fulfillment of the promise […]. Muḥammad Ibn al-Muḥibb al-Ṣālihī (d. 828 AH) was a prolific scholar from Damascus. He conducted classes on the two Ṣaḥīḥs to a general audience in the Umayyad Mosque. He compared his manuscript of the Ṣaḥīḥ with a number of others, and he wrote on the cover page, “What is marked with mīm/wāw in the margins is from the vowelizations of Mawhūb ibn al-Jawālīqī; ṣād/ghayn for al-Ṣaghānī; ḥāʾ/zāy/rāʾ for al-Birzālī; and khāʾ (as a truncated letter), khāʾ (written conventionally) for an alternative manuscript.” He endowed this manuscript to Jāmiʿ al-Ḥanābilah by Mount Qasiyūn in Ṣāliḥiyyah, Damascus. In the illuminated city of Madīnah, I saw ʿAbd Allah ibn Sālim al-Baṣrī’s handwritten manuscript of the Ṣaḥīḥ in eight parts in the possession of the great transmitter, the wise, Shaykh Ṭāhir Sunbul; it was the height of accuracy, cross-referencing, and precision and it was neatly written. He told me that he took it to Turkey to amend the Amīrī manuscript of the Ṣaḥīḥ that was being printed there and was later distributed by Sultan ʿAbd al-Ḥamīd [II] in the masjids and throughout the world. It was harmonized upon this. I am unsure how the manuscript came into his family’s possession. This is a secondary copy of al-Baṣrī’s aforementioned manuscript. In this article, we only scratched the surface in regards to the existing manuscripts of the Ṣaḥīḥ. With the recent discovery of al-Qābisī’s recension, it is becoming increasingly clear that the likelihood of unearthing valuable manuscripts hitherto unknown is no longer mere wishful thinking. Be that as it may, Ḥadīth scholars generally deemed oral transmission as the most authoritative method of establishing ḥadīths and were, therefore, not as concerned with the disappearance of original manuscripts. Al-Qasṭāllānī (d. 932 AH) explains that Ṣaḥīḥ al-Bukhārī’s transmission rests primarily on the medium of oral transmission, not on manuscripts. Al-Ḥusaynī, Itḥāf al-Qārī bi Maʿrifat Juhūd wa Aʿmāl al-ʿUlamāʾ ʿalā Ṣaḥīḥ al-Bukhārī, p. 6; al-Fahras al-Shāmil li al-Turāth al-ʿArabī al-Islāmī al-Makhṭūṭ, pp. 493-565. The al-Fahras al-Shāmil catalogue details a manuscript held in the Qaṭar National Library that was transcribed in 261 AH, five years after the author’s demise. However, Shaykh Khālid al-Sibāʿī from Dār al-Ḥadīth al-Kattāniyyah states that the aforementioned date is incorrect; instead, it should be 1261 AH—an extremely consequential typo (personal communication). Al-Jayyānī, Taqyīd al-Muhmal, vol. 1, p. 63. Based on the chain of transmission cited in the manuscript, we know that it is based on the recension of Abū Zayd al-Marwazī. Mingana adds that it is likely the recension of al-Aṣīlī from al-Marwazī. See Mingana, An Important Manuscript of the Traditions of Bukhari, pp. 26-27. After comparing all the variants attributed to al-Aṣīlī in the margins of the Yūnīyyah—al-Nuwayrī’s copy—with the available folios of this manuscript (ḥadīths no. 1405, 1407, 1435, 1481, 1581, 1599, 1608), it would appear that it is based on al-Aṣīlī’s recension via al-Marwazī. However, there are a few instances where the variants attributed to al-Aṣīlī in the margins of the Yūnīniyyah are in conflict with the present manuscript. Under ḥadīth no. 1909 as cited in the margins of the Yūnīniyyah (p. 74), Qāḍī ʿIyāḍ, who possessed al-Aṣīlī’s holograph, notes that al-Aṣīlī is on record as diacritizing a word as “ghubbiya,” but the diacritics in the current manuscript (p. 30) read “ghabiya.” Also see Ibn Qurqūl, Maṭāliʿ al-Anwār, vol. 5, p. 126. Under ḥadīth no. 1478, the Yūnīniyyah (p. 58) attributes the vowelization of “iqbal” to al-Aṣīlī, but the present manuscript (p. 20) vowelizes it as “aqbil.” Under ḥadīth no. 1496, the Yūnīniyyah (p. 59) attributes the word “baynahā” to al-Aṣīlī. The present manuscript (p. 24) has “baynahu” in the main text, but the word is written as “baynahā” in the margins and is stamped as correct (ṣaḥḥ). Until the entire manuscript is located and examined, it is difficult to say with certainty which recension it is based on via al-Marwazī. See al-Sallūm, “Introduction,” in al-Mukhtaṣar al-Naṣīḥ, pp. 76-77; cf. Blecher, Said the Prophet of God, pp. 5-6. 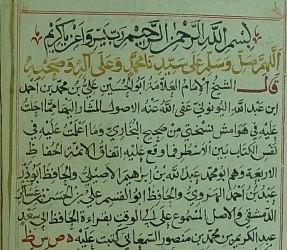 Mingana postulates that this manuscript was either written by al-Aṣīlī or dictated by him. The claim that this is al-Aṣīlī’s handwritten manuscript is problematized by the fact that al-Aṣīlī was from the Maghrib and this manuscript is written in Naskhī script. Recently a manuscript of the Ṣaḥīḥ has been located in a private library in Algeria with a reading signature dated to 440 AH. It was transcribed from Ibn Mīqul al-Mursī’s (d. 436 AH) manuscript which in turn was copied from al-Aṣīlī’s holograph. For more details on this manuscript, see https://twitter.com/almaktutat/status/1092471460717887491. Al-Manūnī notes that al-Ṣadafī had written a second manuscript of the Ṣaḥīḥ from Muḥammad ibn ʿAlī ibn Maḥmūd’s exemplar. See al-Manūnī, Qabas min ʿAṭāʾ al-Makhṭūṭ al-Maghribī, pp. 95-96. Al-Kattānī, al-Tanwīh wa al-Ishādah, pp. 53-54. In his introduction, al-Yūnīnī explains that the mother-text for the cross-analysis was copied from the manuscript used for the authorization he received from his teacher Abū ʿAbd Allāh al-Ḥusayn al-Zabīdī in the citadel of Damascus in the year 630 AH. Abū Hāshim al-ʿUtaybī argues that the mother-text was copied from ʿAbd al-Ghanī al-Maqdisī’s manuscript, which in turn was copied from Abū al-Waqt’s manuscript and contained variants from other recensions. Based on the attendance signatures on al-Maqdisī’s manuscript, al-ʿUtaybī continues, it is clear that this was the manuscript al-Zabīdī utilized in 630 AH when teaching al-Yūnīnī. Hence, al-Zabīdī’s authorization of Ṣaḥīḥ al-Bukhārī described in al-Yūnīnī’s introduction was based on al-Maqdisī’s manuscript, and therefore, it was the source of the mother-text. See al-ʿUtaybī, Kitāb Jabr, pp. 68, 122, 29, 163, 401; cf. Jumuʿah, Riwāyāt, p. 678. Al-Qasṭāllānī, Irshād al-Sārī, vol. 1, p. 41. See al-ʿUtaybī, Kitāb Jabr, pp. 158-159 and 182-192; cf. Saʿīd al-Jūmānī, “Ṣūrat al-Ijāzāt al-Manqūlah fī al-Makhṭūṭāt al-ʿArabiyyah,” Journal of Islamic Manuscripts 9 (2018), 85; al-Maʿṣarānī, “Tajalliyāt al-Jamāl,” pp. 15-19. Al-Dhahabī, Tārīkh al-Islām, vol. 14, p. 637; idem, Siyar Aʿlām al-Nubalāʾ, vol. 22, p. 97; Yūsufān, al-Muḥaddith al-Ṣaghānī wa Nuskhatuhū min al-Ṣaḥīḥ, p. 3. Al-Kattānī, Fahras al-Fahāris, vol. 1, p. 198.